Like most other carmakers, Aston Martin isn’t stopping at just one SUV. Aston Martin was never going to stop at just one SUV. 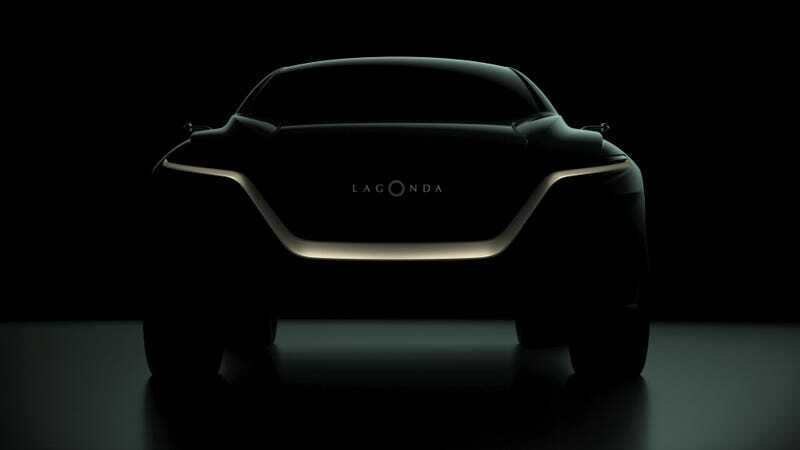 Meet the shadowy silhouette of the Lagonda All-Terrain Concept, an electric SUV set to debut in March, into a world already welcoming the Audi E-Tron. Aston didn’t say much in announcing the concept, other than that it’ll debut at the Geneva Motor Show. A-M calls this the “first model Lagonda will put into production,” which is presumably because it forgot about the million-dollar Taraf sedan, as you may have as well. Lagonda was once an independent sports car company long ago absorbed into Aston and principally used for its top-end sedans, but the name is now reserved for EVs. It’s what the company calls the “world’s first luxury zero-emission brand,” which is presumably because it forgot Tesla exists. We’ve known an electric SUV might be coming for about a year now, when Aston Martin told Auto Express that Lagonda would likely become its own brand. The company showed off the Aston Martin Lagonda Vision Concept this time last year, which was a design study for what its future zero-emissions cars could look like. The concepts have the Lagonda name because, as Aston CEO Andy Palmer explained to Auto Express last year, he believes differentiating electric and non-electric lineups completely is best in order to avoid confusion. The first Lagonda EV, as Autocar speculated at the time, would be an SUV called the Varekai. Palmer said the concept will “offer explicit clues” for the coming production model, although production models are often tame in comparison to concepts. But perhaps Lagonda, known for its wild side, won’t won’t water things down, and this Lagonda will be the luxury electric vehicle that will change our hearts and minds forever in regards to supercar companies cranking out SUVs. Or perhaps it won’t, and we’ll all sigh, nod and go back to talking about making track-only Aston Martin Vulcans street legal.